Look sharp and you could win a medal! YOUNG sports fans kicked off a summer of free activities on Tuesday when they sharpened their skills at Cantelowes Gardens in Camden Road. 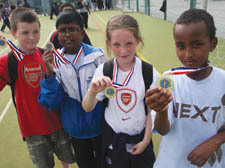 Scores of children played football, cricket, basketball and hockey at a special sports day organised by Camden Council’s sports development officers. Children aged 8-17 from across the borough can do the same this summer at a host of free courses which include girls’ football sessions, weekday swimming, sports leaders’ awards, netball, ­tennis and dance. Basketball camps are also running at Acland Burghley School in Kentish Town for £5 a week. For more info call 020 7482 9894.